The new 60D represents something of a rethink on Canon's part, now more clearly positioned as a prosumer SLR camera that sits halfway between the cheaper, more consumer-focused 550D / Rebel T2i and the more expensive, semi-pro 7D. Current 50D owners looking to upgrade may miss that camera's more durable metal body shell, slightly faster burst shooting, more intuitive joystick control, PC sync socket and support for Compact Flash cards - they'd be better advised to look at the 7D - but for the rest of us, especially those interested in video, the 60D is a compelling addition to the Canon EOS range. 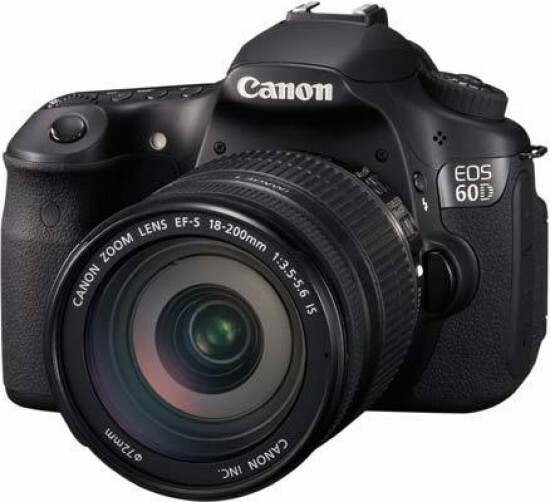 The 60D shares many of the features offered by its little brother, the Canon EOS 550D / Rebel T2i - a 3 inch 1040k-dot LCD screen with 3:2 aspect ratio, 18 megapixel sensor, 63-zone metering, Full HD movie recording with user selectable frame rates, and similar build quality. We'd still recommend paying the extra cash, though, principally for the 60D's excellent vari-angle screen, better viewfinder, secondary LCD screen and control dial, speedier burst shooting, more refined movie mode, and much more intuitive control layout and handling. The EOS 60D also shares the same image sensor as the 550D / Rebel T2i and 7D, and therefore the same outstanding image quality. You may think that bumping the megapixel count to 18 on such a comparatively small sensor would only degrade the resulting photos, but thankfully you'd be wrong. The 18 megapixel CMOS sensor and expanded ISO range produce virtually no visible noise at all from ISO 100 all the way up to ISO 1600, with even the three faster settings of 3200-12800 producing perfectly usable images. All other image quality aspects are up to Canon's usual high standards, so top marks go to the 60D in this department. Just make sure you buy something better than the EF-S 18-200mm lens that we were supplied with to get the best out of all those pixels. Ultimately the 60D takes some of the best features of existing EOS models and blends them together to create a DSLR that challenges the likes of the Nikon D90 more directly than the previous 50D did. While there are few genuinely new features here, the EOS 60D is a joy to use, that irksome four-way controller aside, with one of the best movie modes on any EOS SLR. Ironically the 60D's biggest threat comes from a camera that isn't even in the shops yet - the Nikon D7000 - which on paper offers a number of advantages that crucially includes continuous autofocus during movie recording. For the moment, though, the Canon EOS 60D is a full-featured, intuitive and very capable DSLR that takes fantastic stills and video and which still hits the all-important £1000 / $1000 price point.